Yes, it is the kind of high-concept kitsch that studio pitches are made of (“what if we had a cop movie, see, but the cop is an extra-terrestrial”). Yet this most unlikely of goofy summer popcorn flicks is actually a pretty decent Western, and a sly social commentary on our run-down economy to boot. 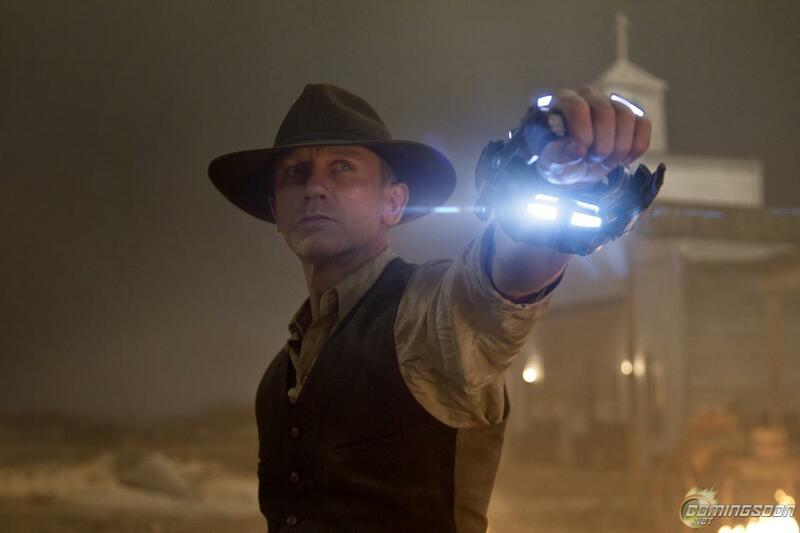 Daniel Craig plays the Clint Eastwood role as the mysterious stranger with a past (Jake Lonergan). He wakes up in the middle of the desert with a metal thingamabob on his wrist and no memory about who he is. Yet he hasn’t lost is reflexes and karate chops a posse of highway men who attempt to rob him as quick as you can say “genre bender.” He is clearly one bad dude who has had one really bad night. Into town he rolls, and soon finds himself up against the local town robber baron, Woodrow Dolarhyde – played with marvelous gruff charm by Harrison Ford, making one of the best big screen comebacks since Norma Desmond in Sunset Boulevard. Dolarhyde is the type who nearly – but not quite – draws and quarters a suspicious ranch hand telling strange stories about blasts from the sky. Who’d have thought that Ford had yet to do some of his finest work, and would do so in an end-of-summer movie that seems to have been created out of some all-night screenwriting drug-induced bender? Dolarhyde’s son, a good-for-nothing skinny bully, strolls into town – drunk or cocky or both – every so often to wreck havoc on the townsfolk. This time he encounters Lonergan, who immediately makes him an enemy, along with Dolarhyde, of course. Then the aliens arrive, and all hell breaks lose. The aliens fly around in cheap metal go-carts (how’d they get here in those jalopies?) and lasso the townsfolk to take them back to their mother ship for who-knows-what kind of disgusting probing, slave labor, or gourmet dining. They are just enough like disgusting, green cattle rustlers kidnapping a bunch of injuns that this plot development feels not at all unnatural and – aside from the laser beams – actually a rather classic Western development. Naturally, the sheriff asks Longergan to assemble a posse of beleaguered townsfolk – including Dolarhyde, of course – to set out after their stolen kin. What follows is scripted from the playbook of every classic Western that has come before, as Jake needs to regain his memory and his purpose, Dolarhyde needs to regain his heart and his passion, a little boy needs to take his first steps towards manhood, and the two men find they are more complicated – and more alike – than they seemed at first. Meanwhile, those aliens and their Arcosanti inspired ship are here doing some serious strip mining, and it will take real cooperation amongst the various warring Western factions to scare them off. This is where one might stretch and say the movie plays into the present day angst by giving us a predator class, not unlike present day politicians and bankers, who are after one thing – our gold – and a populous of various competing interests who need to wake up and cooperate if they are to realize that these predators see them as nothing more than food. The aliens and their warren of a ship seem a bit stolen from every other recent sci-fi, but never-you-mind. This is really an old-fashioned Western more than a sci-fi, and it follows all the good old Western tropes. Who’d have thought it would have taken a visit from outer space to inspire some of the best Western writing the genre has seen in decades?